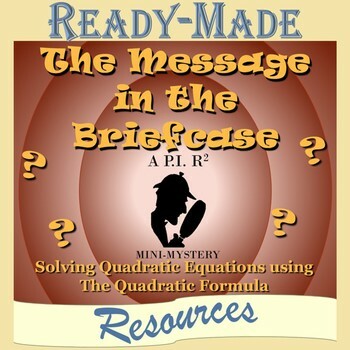 In this fun activity, students are asked to decode a message, and they have to solve quadratic equations to do it! Students will calculate the solution to each quadratic equation by using the quadratic formula. They will use their answers to decode the hidden message at the bottom of the page. When they have finished all 15 questions and filled in all the blanks, students will know what was in Ms. Mann's Briefcase. You wont want to miss the conclusion of the mystery as well! All four of these great activities can be purchased as a set at a discounted price!